Repair of weak or ineffective brakes is not something to be scheduled for "one day," when you can spare time for it. You must plan a visit to a reputable auto brake repair shop in the Milton, WA area as soon as you observe even the slightest malfunctioning in the brake system of your vehicle. Powerful brakes are critical not just to keep your vehicle and its occupants safe, but also for the well-being of other commuters who are on the road with you. You owe it to yourself and everyone else to get your faulty or failing brakes fixed. At our auto repair facility, we have the knowledge and resources to resolve all types of problems with car and truck brakes. When you drive into our auto brake repair shop with your Milton vehicle, our technicians inspect its brake system thoroughly to find what exactly is wrong. After that, we restore the lost efficiency and reliability of your brakes with enduring repair solutions. As the primary safety feature, brakes are a vital component of a vehicle. Your car or truck cannot be considered roadworthy if its brake system is not working perfectly. Considering how crucial efficient brakes are for safe driving, you cannot let anyone but the most accomplished technicians repair them. We are proud to be the auto brake repair shop that Milton vehicle owners rely on for quality services that they and their precious rides deserve. Meanwhile, our competitive prices ensure that the best place to get brakes done is also the cheapest place to get brakes done! 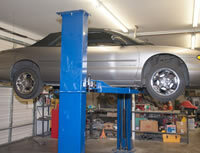 Lakewood Auto Body is the auto brake repair shop Milton residents have trusted since 1962. Dial (253) 581-0220 to schedule a visit.